In their fortress, the Four Horsemen debate the fact that the Oolong tech could potentially undo them, and decide to go to war. 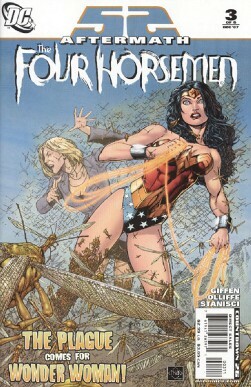 Veronica Cale accepts international aid from Checkmate and others, using the Four Horsemen and her potential to stop them for PR. Terrific demands transparency. Back at ground zero, Snapper Carr banters with the big three about his reason for being there... he's been deep cover with Checkmate since before the OMACs, and has used his access as a way to help prevent superhero debacles. Superman, Batman, and Wonder Woman strategize with Carr chiming in. Superman attempts to throw a large chunk of ice into the Four Horsemen's lair, and it erupts in flames. Superman returns, perplexed. The Four Horsemen emerge from the flames, triumphant, preparing to raze, and also to slake Famine's hunger. Back at camp, Superman and Batman are confronted by Famine and Death, with Death causing Superman's arm to flare with pain. Wonder Woman goes to confront the zombies, and finds herself traveling through a cloud that leads to Oolong Island, somehow, before a wall of zombies. Story - 5: Again, the plot is nothing insane to write home about, per the first one, very formulaic when it comes down to it, but what's making this series rock is the execution. The care for character, the dialogue, and the beats are all very well handled, to my mind. Snapper makes me giggle in a way that makes me say, "Neal, you're a nerd." Batman's annoyance with Snapper, Superman trying to take a fatherly tone, and Snapper Carr throwing off quips when Superman comes back to call him Clark, because, "Clark's fine. I've known for years." Batman telling him to shut up, and yet he persists, and is right. I'm finally digging Snapper, God help me. I like the mystery of a giant block of ice fueling the Horsemen somehow with fire, and I also like the way Cale is being handled. She's calculating, cold, and every bit the intent of her character as a Lex Luthor for Diana. As Wonder Woman ends up on her doorstep with the end of this issue, I can't wait for the next all the more. Art - 5: Another reason the story rolls well is the fine art. All of the Horsemen are very distinct, Snapper rocks, the big three all have their own look, and the action is rendered in a way that makes what might have been a wasted page with bad art (massive explosions) incredible by comparison. Great splashes, great motion, great paneling. All around good work. Cover Art - 3: Oddly bright, given the issue, and also symbolically representing something that doesn't happen IN said issue. The level of detail is phenomenal, but the characters are in awkward poses, and look a little off. How to put this gently? Wonder Woman's breasts are spaced quite far apart, and it draws your eye to them for that reason beyond the typical, and pulls you out of the image, as one flops over her arm but the other stays stationary. How odd a sentence is THAT to write? Still, the detail alone is worth a good nod, if not a five.